The QBC dry hematology technology begins with its unique blood collection tubes. These high grade tubes are internally coated with all necessary stains and reagents and are easily filled with just 65µL of blood from finger sticks, heel sticks, or venous draws. The QBC centrifuge rotates the tube at 11,000 RPM for approximately 5 minutes. Due to their varying densities, the different components of blood separate into layers during this process. 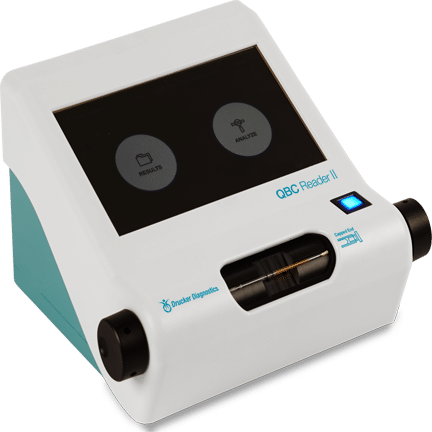 Due to its specific density, the precision float stretches out the platelet, lymphocyte and monocyte, and granulocyte layers to make these small layers more easily measurable. The precise specific density of the float also allows for the direct measurement of the hemoglobin concentration in the red blood cells. 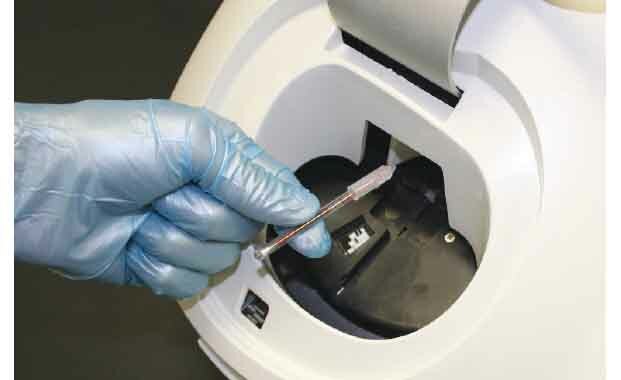 Dry Hematology, which is unique to the Drucker Diagnostics hematology analyzers, performs a complete blood count without the addition of any diluent or liquid reagents. Instead Dry Hematology uses only a precision sample collection tube that is internally dry coated with all necessary reagents, which include Acridine Orange Fluorochrome stain and anticoagulants. 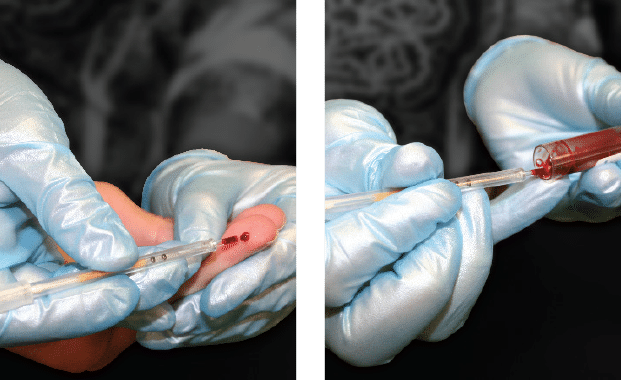 When the hematocrit sample collection tube is filled with approximately 65 microliters of either capillary or venous blood, the dry reagents in the tube mix with the blood sample. A precision mechanical expander (float) in the tube expands the Buffy Coat (white blood cells and platelets) and allows the cells to be digitally imaged. Blue LED’s illuminate the sample, causing the stained bands of cells within the tube to fluoresce different colors. The fluorescent light then travels to the camera, where the digital image is captured and the cell counts, hematocrit, and hemoglobin are measured. 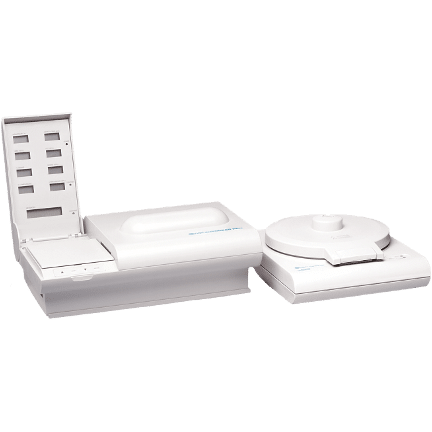 When the alternative is emergency transport to land, QBC dry hematology analyzers provide a quick way to establish the needs of the patient. Their compact size, ease of use and the lack of liquid reagents makes them ideal for the occasional requirement of cruise ship clinics. Compact, rugged, easy to learn and to use, QBC dry hematology analyzers are standard equipment on military ships of several nations. 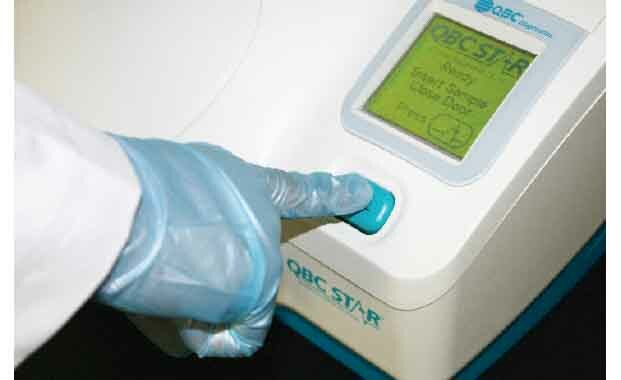 QBC dry hematology analyzers are easy to set up and use. They require no liquid reagents or daily maintenance. The disposable tubes have a shelf life of 12 to 18 months. This is why the Emergency Management Agencies of several nations include them in the kits shipped to disaster sites. 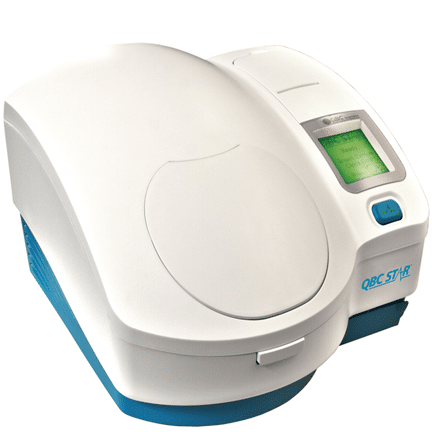 QBC dry hematology analyzers meet the “urgent” requirement in “Urgent Care”. Results are available in 7 minutes from a finger or heel stick or from a venous draw. The easy to use and learn instruments have no liquid reagents and require no daily maintenance. When trying to decide if flying to a foreign hospital is warranted, the QBC dry hematology analyzers come in handy. No matter how long it has been since their last use, they are immediately ready to be used. No time consuming cleaning, no finding that liquid reagents are out of date.